Maude Malone was a New York suffragist and an avid supporter of the campaign for a national woman’s suffrage amendment. 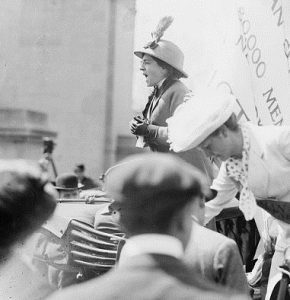 Malone had little fear of speaking out for her cause and on one notable incident she interrupted President Woodrow Wilson giving a campaign speech in 1912. In his speech at the Brooklyn Academy of Music, Wilson was discussing the effect of monopolies on the American public. She exclaimed, “How about votes for women? You just said you were trying to destroy a monopoly, and I ask you what about woman suffrage? The men have a monopoly” (Marguerite Kearns). Malone’s dedication to woman’s suffrage continued during her time as a member of the National Woman’s Party. In 1917, she marched as a picketer to the White House. On September 4th during a conscription day parade of drafted soldiers, she and twelve other women marched from Cameron House, the headquarters of the National Woman’s Party (Cooney, 354). The suffragists took their place in front of President Wilson’s reviewing stand and carried a banner that read, “How long must women be denied a voice in a government that is conscripting our sons” (Irwin, 245). The crowd that surrounded President Wilson watched their display for woman’s suffrage intently and the suffragists were quickly arrested (Cooney, 354). Malone and her comrades were tried on September 5th, charged with unlawful assembly, and sentenced to sixty days at the Occoquan Workhouse (Cooney, 354). The actions taken by Malone and her colleagues during the conscription day parade led to the resignation of Dudley Field Malone (no relation of Maude Malone). Field Malone was presidentially appointed to the position of the Collector of the Port of New York. He was a friend to the National Woman’s Party and resigned his post in protest to the treatment of the suffragists by the government (Irwin, 246). In his resignation letter to President Wilson he stated, “the present policy of the administration, in permitting splendid women to be sent to jail in Washington, not for carrying offensive banners, nor for picketing, but on the technical charge of obstructing traffic, is a denial even of their Constitutional right to petition for, and demand passage of the Federal Suffrage Amendment” (Irwin, 246). Field Malone’s resignation reflected the growing prominence of suffragist efforts by women like Maude Malone and the National Woman’s Party. After her time was served in Occoquan Workhouse, Malone continued her involvement with the campaign for woman’s suffrage and her affiliation with the National Woman’s Party. Sources: Robert P.J. Cooney Jr., Winning the Vote: The Triumph of the American Woman Suffrage Movement (Santa Cruz, CA: American Graphic Press, 2005). Inez Haynes Irwin, The Story of Alice Paul and the National Women’s [Sic] Party (Fairfax, Va: Denlinger’s Publishers, 1977). Marguerite Kearns, “Maude Malone Speaks Against President Wilson,” Suffrage Wagon.